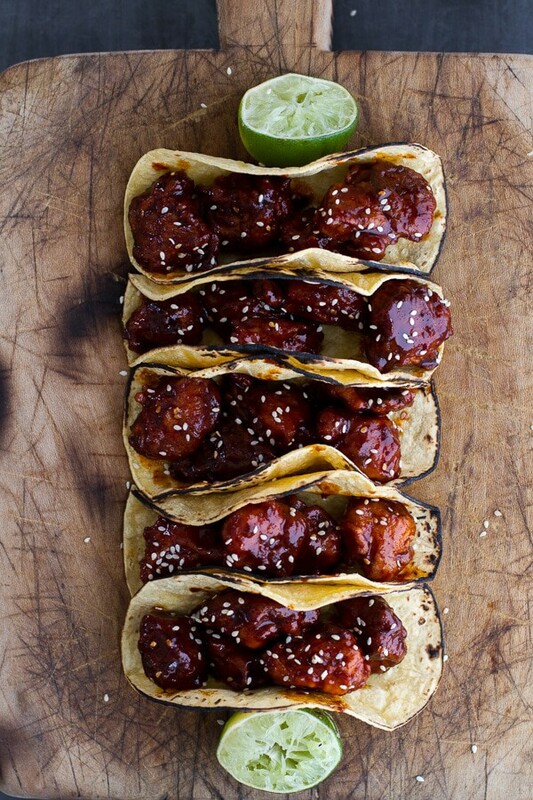 If there’s something you’re going to fry, it needs to be these Korean Fried Chicken Tacos. And this is coming from someone who does everything she can not to fry. Oddly though, I have now fried three things this week. Huh, maybe I secretly love it? Nope, I don’t, but sometimes the mess and grease are worth it. Like for doughnuts, well and really any fried dough. And definitely this chicken. Seriously though, this chicken is special. When I saw it over on one of my favorite blogs, The Tart Tart a few weeks ago I knew it was something I really wanted to try. It’s all about two important things. One, it’s double fried, and two, the sauce. The sauce is amazing and it’s due to Gochujang sauce. A word I have not a clue how to say, but I do know that it’s Korean hot chile paste and it MAKES this chicken. I could not find it at my local store (surprise, surprise), but I just ordered it on Thrive Market, which for me is actually easier than going to the store. Speaking of Amazon though, I kind of, sort of, think it would be awesome if everything could be bought from Amazon. My life would be so much easier. Oh but, speaking of life? The barn is really happening. Like floors, and counters, all the stuff is being planned and picked out. I need help. No really, I do! Please start telling me the do’s and don’ts. What’s your favorite flooring? Bathroom sink? Lights? Windows? Furniture?? Taking any and all advice. Starting like yesterday. I have so many ideas, but putting them all together into one space is hard. Kind of the way it is with my recipes and deciding on just one flavor, or whether to go fried or baked, chicken or tuna, savory or sweet… while you get the picture. Only this is permanent. This is my new home. Exiting and overwhelming all at the same time, but mostly exciting. With so many decisions to make, the only thing I am sure of is that you’ll love this recipe. 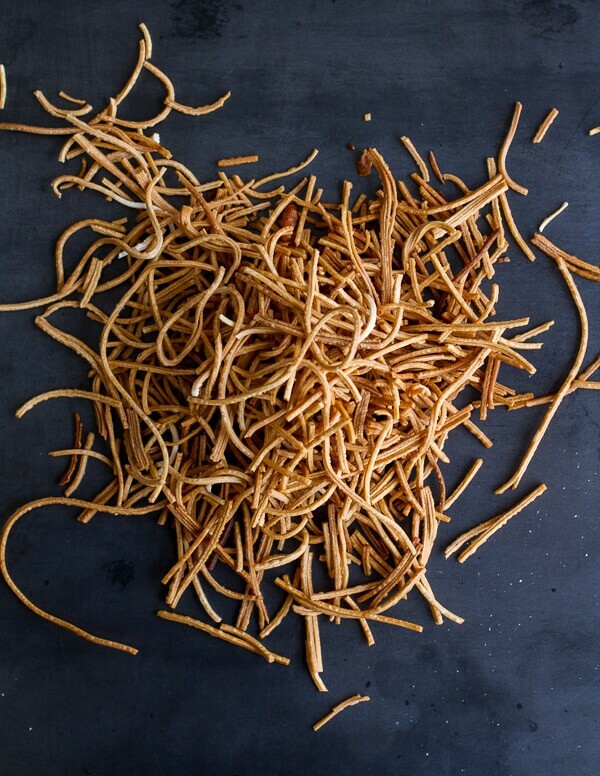 With crispy noodles and queso fresco, there is nothing not to love. Go on, give it a try! In a large bowl mix together minced or grated garlic, grated ginger, soy sauce, gochujang, rice vinegar, sesame oil and honey. Set aside. Divide the chicken among the warmed taco shells. Top with sesame seeds and slaw. Add the crunchy noodle, cilantro and queso fresco. DEVOUR! *Korean Fried Chicken seen on The Tart Tart and adapted from Saveur. Oh, and if you start your day with this bowl, and end it with these tacos, your Wednesday will be completely balanced. 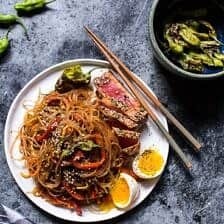 30 Minute Korean Stir Fried Shishito Pepper Rainbow Veggie Noodles with Seared Tuna. wish I could read minds, but I am not that good! I’ve never had Korean fried chicken, but I love anything Asian and anything fried…hello perfect meal! 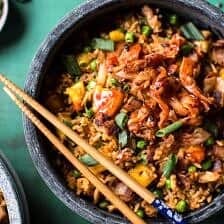 As a Korean-American (born and bred in NYC), it’s wonderful to see a slice of Korean cuisine on your blog! This looks absolutely drool-worthy delicious!! I adore gochugang! It adds the perfect amount of sweet, spicy and saltiness to anything. When I use it for bibimbap, I swear I use 1/4 cup for my own bowl alone. This looks amazingggg! Can’t wait to try this recipe Tieghan! Thanks so much, Kathy! Hope you love it! I can’t even handle how awesome these are, T! We loooove korean fried chicken! Must try these! I just made korean on tuesday, and NOW these show up! Unfortunately, I don’t think my family can handle anything else foreign for another week or so. Drat! Amazon is seriously my weakness and I buy everything from there. Need to get sauce ASAP for fried chicken. What are you doing to the barn? Making it a home/studio space! Check is out here. Yes, yes, a million times yes! Tieghan, this is a thing of beauty! And the Korean in me is chomping at the bit to try these 🙂 I can’t wait to see updates on the barn, especially the cooking space! I am loving these tacos! So actioning these this weekend! LOVE! 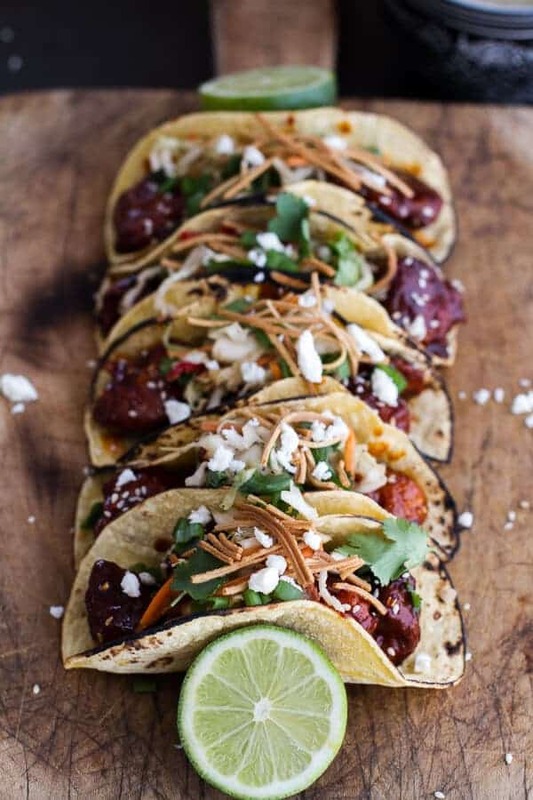 I could easily go loco on a batch of these beautiful tacos! Love all those fresh and zesty flavors packed into a tortilla! Another winner of a recipe, Tieghan. The universal law is: There is never enough kitchen bench space/desk space. Once you have space, you fill it up. So don’t stress and have fun designing your barn. Do you need to limit your options? Budgets do that very effectively. If your budget is tight that’s when you start delegating projects to people who have power tools or like messing around with gooey adhesives. It doesn’t have to be perfect, as long as it feels like home. You can change things down the line, including walls if necessary. From the pictures pinned, you look like you know what you want. Trust yourself. A wise lady reminded me after I’d been bitching and complaining about my first attempt at kitchen remodelling “Does the kitchen sink work? Yes? Good, the world can start turning again.” Which made me laugh and lighten up a tad. Renovating can drive you to drink but it’s worth it. Nice taco’s too. Thank you so much for the words of wisdom. Counter space is a must and I will try and not stress. Fun is the route I am going! Tieghan, as usual you have me drooling first thing in the morning. Gaa! 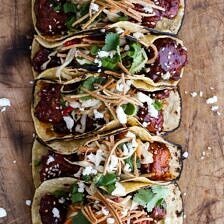 These tacos look so good! I love me some mexican-asian fusion! Oh, and if I were renovating an old barn I’d head on over to the Schoolhouse Electric website. Have fun making it your own! You deserve the success girl! Thank you so much, Heather! Checking out that awesome website now! What I love about my kitchen is that right under my cutting board next to the sink is my trash compactor. I pull the drawer and I can sweep my mess right into the garbage. It comes in very handy and really helps with the clean up. I also have a container for my worm box and compost nearby. Love that suggestions! Thanks so much! looks good. love korean bbq. Also, please post more pictures and videos of your adorable cat. I’m obsessed. Haha! Will do! Thanks Kerry! If you are making a kitchen in the barn. Might I suggest. Shorten the cupboard doors under the sink, add a drawer where the toe board is for your tea towels and dish cloths. * A bakers counter … it is lower than your other counters and is a must. Makes mixing and rolling etc. so much easier. Ohhh!! Love these tip! A bakers counter sounds awesome. Never would have thought of that. Thank you! 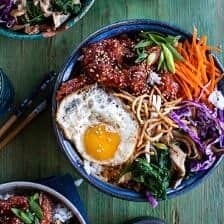 Now that you have that gochujang you need some bibimbap in your life! I say it like “go-choo-jong” like gong, I’ve also heard “go-choo-jang” like gang. 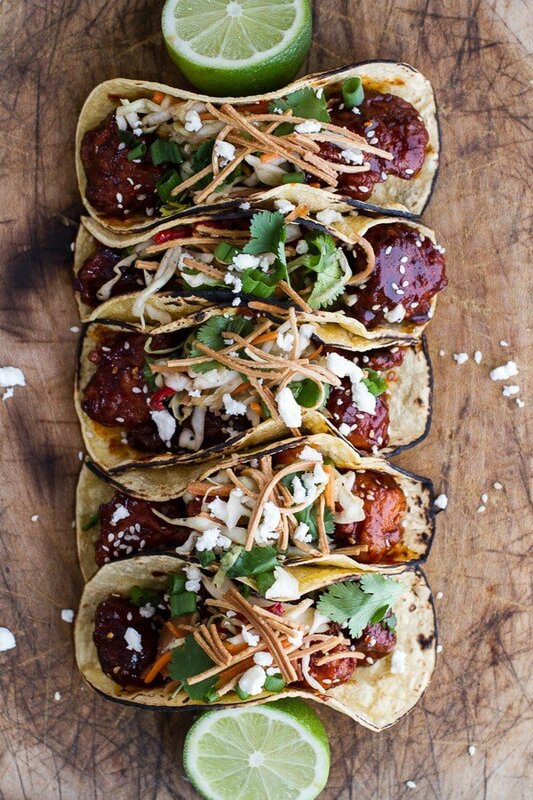 Anyway, these tacos look AMAZING! Korean food is my Seoul food (horrible pun intended)…I was actually born in Seoul! Oh now way! I need you to teach me your secrets of Korean cooking and making bibimbap has been on my list for so long. Need o make it happen! Fried chicken is always a resounding yes! with me, especially if it’s in taco form with all kinds of stuff like crunchy noodles, spicy sauce and queso fresco. Looks awesome! Word on buying everything from Amazon. True story – when I want to buy something, I first check Amazon to see if I can get it there. Anything to get out of going to a store because front door delivery is da bomb. 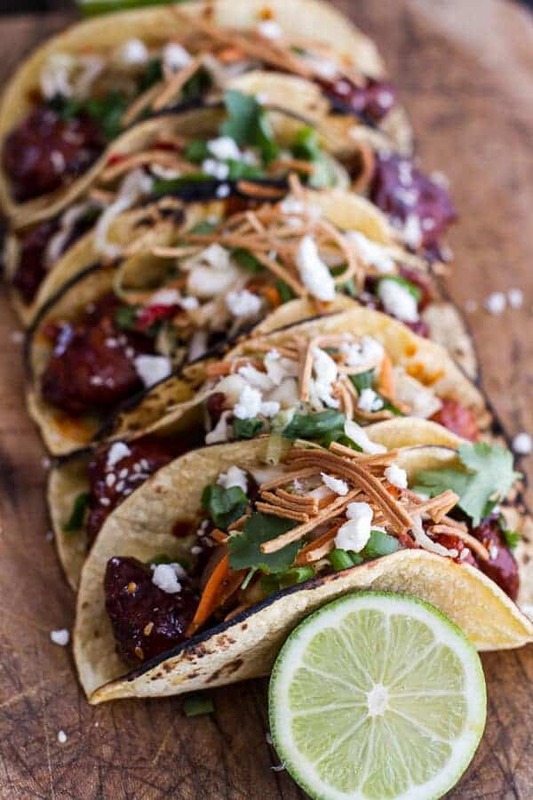 Totally digging these tacos, Tieghan! 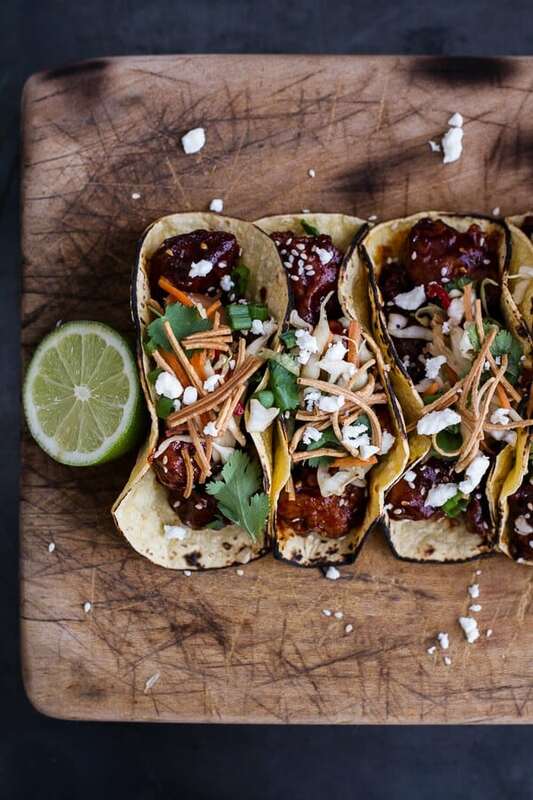 I may just have to get over my dislike of frying stuff (mainly because I can’t stand the way it makes my house smell) so I can make these tacos! Yes, yes, I do the same!! West Elm is everything for my home decor needs, so there’s that. And obv Amazon will make life easy with that too 🙂 Love the way this chicken looks and def need to look into that chili paste! West Elm and Amazon is the best. Love them both! i love the look of this. I want to learn more about korean food – this is great inspiration. Thanks Tieghan! You have got to try it, So good!! Thanks Stephanie!! 🙂 Happy Baby shower (well virtual baby shower) day! I’m totally anti-frying too because of the mess and the fact that I’ll smell like whatever I fried for the next 5 days…BUT these tacos look 1000% worth it. I’m gonna check out our local Asian grocery store ASAP for that sauce! I feel the same!! But yeah, these are a must try! Your wish might come true with Amazon! Apparently they are starting to sell groceries in the West Coast, haha! I’m not going to lie–if the shipping was free, I would probably take them up on that offer. 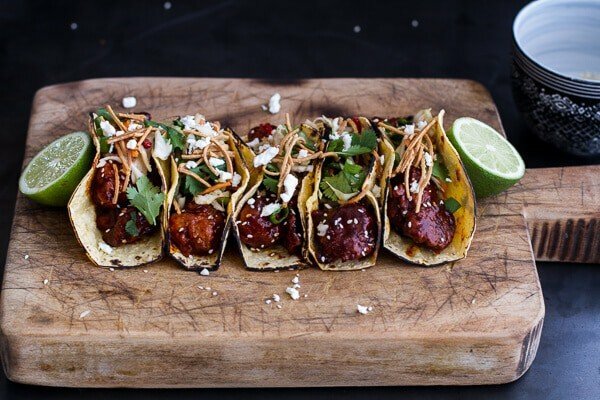 These tacos look insane! That chicken! No way? That’s weird. How they going to do that? werid. I saw this on Foodgawker and had to stop by to tell you how gorgeous your pictures are and how delish this recipe is. I am so glad that you have delved into the world of frying! I hope you are, equally, as successful with your barn! Thank you so much, Betsy! That means a lot! I’m pretty much OBSESSED with this recipe. I’ve been REALLY into gojujang lately and omg, I’ve been eating my weight in Korean tacos from food trucks. Love love this!! Oh my GOSH, Tieghan, these look amazing! and then as far as lighting, OY! that has been such a struggle for me. if you ever find words of wisdom on that, i’d love to know. that’s such a difficult thing. and speaking of photos, these tacos are BEAUTIFUL!! i am officially in the mood for them and it’s not even 10am. Thank you so much, Molly! I have been following your farm house facelift post and love them!! It is looking so good! 🙂 I think I need to send you an email so we can talk about all this stuff, I need your help! Love those floors, I just clicked over! Oh and as far as lighting goes I have not entered that area yet, but I let you know if I come up with anything awesome! yesyes! send me a shout. we should totally talk renovation stuff. also p.s. i made these tacos last night and they were FANTASTIC! 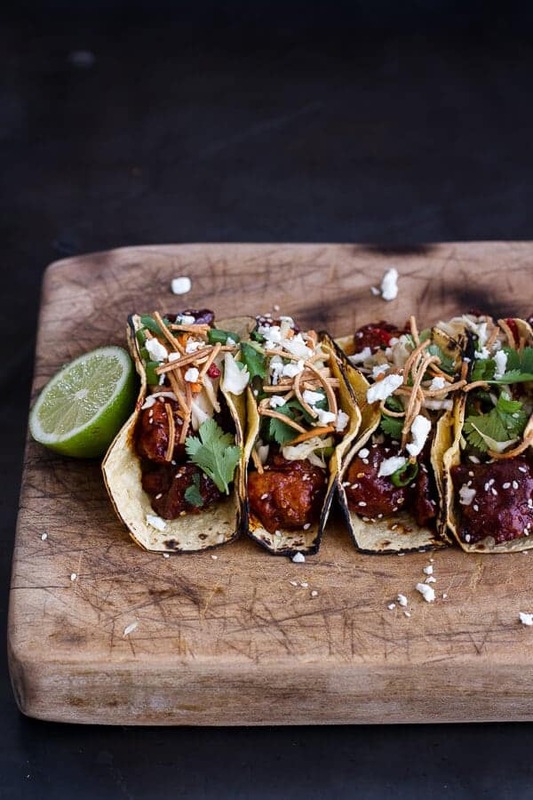 These tacos are so fun, love the Asian flavors and the unexpected toppers! These flavors and textures sound outrageously yummy! Gorgeous pics, too! When frying the chicken for the second time do you recoat it in the cornstarch mixture? No, you just place it back in the oil for a second time. Let me know if you have any more questions. Hope you loved these tacos! How do you prepare the soft corn tortillas to look like that? One or two thick? I use one corn tortilla and then place it over on open flame (I use my gas stove top burner) to lightly charr and warm the tortilla. I’ve never left a response before, but I’ve been lurking for awhile. I had to back you up on gochujang/gojujang (I’ve seen it spelled with a k, as well.) though. We LOVE this stuff and think it’s going to be the “new” Sriraccha. I order it on Amazon, too, but there are so many choices. How did you decide which one to order? Hey Aj! I just order the cheapest + one that was Amazon prime. Can you bake the chicken instead of frying it .. and for how long if that works .. ? Yes, you can. I would bake it at 425 degrees F. for 20-25 minutes. Let me know if you have any other questions. Do you have the nutrition values? I am sorry, but I do not. You may calculate them online though. Wow! What a beautiful dish! Korean food is my absolute favorite, and you have created quite an amazing looking fusion dish. 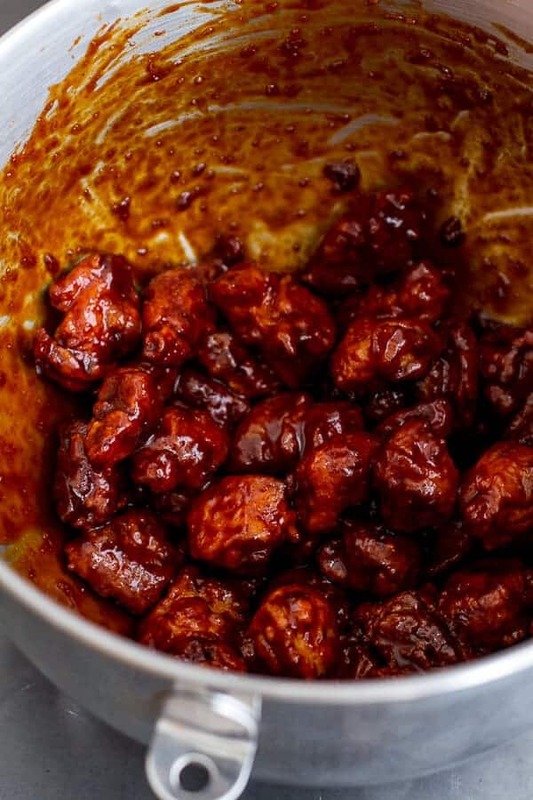 You need to try bonchon chicken if you are ever in New York…. I can’t wait to try these . They look great just f.y.i . If you have a safeway grocery store , or central market in your area those stores sell gochujang sauce . 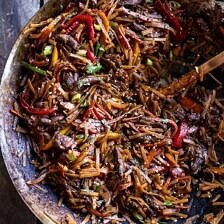 I just used a slaw mixture instead of the cabbage/peppers/carrots as it was easy to throw in a bowl. I couldn’t find queso fresco, so I subbed feta, which was great! I also nixed the noodles, as I thought I had some, but turned out I didn’t, and it was perfectly fine without it! Tieghan, these look so more-ish. I can’t wait to try them. I just love Asian cuisine so to have this fusion sounds delicious! Ah yes!! I think you love this one then!! Thanks!! This is a beautiful recipe with lots of visual and textual appeal. I think frying the chicken is overkill. The coating takes over the flavor of the tacos and doesn’t Iet the flavors come together in the taco. I sauteed the remainder of the chicken and it was far better in my opinion. I am really glad you liked this recipe! Thank you! That is very interesting! Thanks Dena!